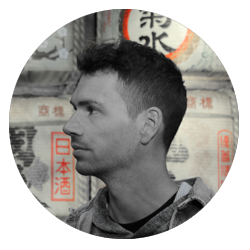 Do you like countless museums? Old city parts? Historical forts? And tons of food? 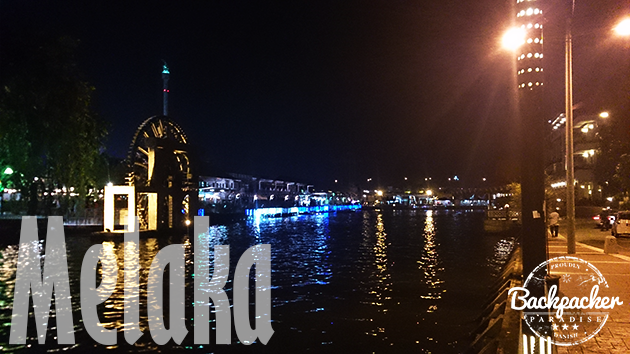 If all your answers to those questions are a big bunch of big yeses, then Melaka is the place for you! Our host Jerry is a guy with the heart in the right place. He was hosting us during the weekend even though he had work. He dropped us off in the city in the morning and picked us up in the afternoon. A very welcoming guy who share his home with total strangers. 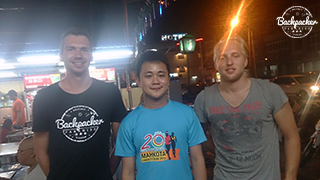 On the night we arrived, Jerry took me and Lasse to Jonker Street night market. This is something for the food adventurous people out there. Durian is this famous, smelly, weird tasting fruit. 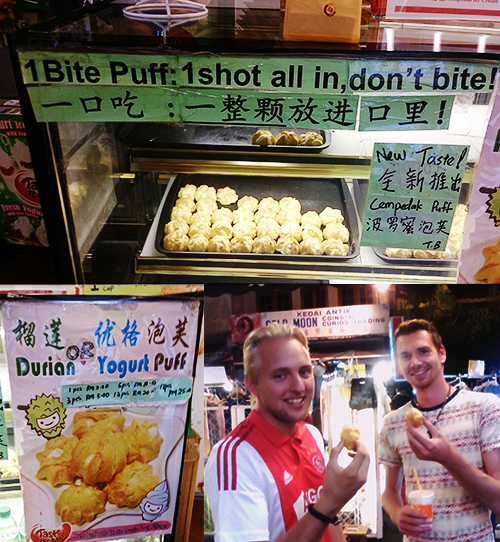 In Jonker Street you can find seller of 'Durian Puff'; yougurt and durian mixed and put into a ball of bread. It's a one-bite experience which you might not like, but spitting anything out is not part of the deal. Anything with chicken and rice really. There is one place though, right next to Hard Rock Cafe (which is also always worth a visit, even though it's not too budget friendly). There's a place called Huang Chang to the left when you're standing and looking towards HRC. You wont miss it as people are waiting in line for a table at this fabulous chicken rice ball serving restaurant. This is a must-try in Melaka. Yep, that's right, deep fried ice cream. 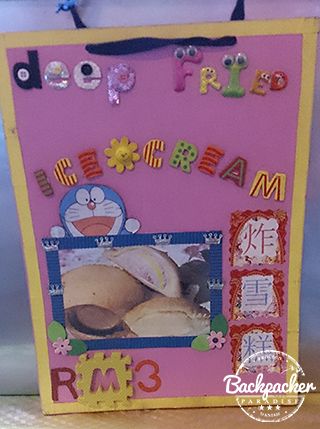 Not only is this speciality available in Jonker Street night market, it's also extremely delicious. Simply choose your flavour of ice cream and enjoy the taste of what I like to call the Katy Perry Mix (Hot N Cold). 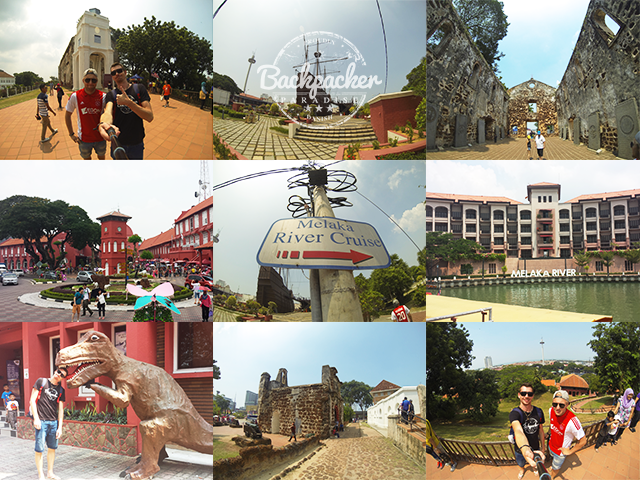 Besides the many amazing food choices to take in Melaka, there's also quite a few old forts from the time of colonisation as well as churches. What there's even more of is museums. Almost every street has a museum with the Baba & Nyonya Museum (Entry fee: RM 15.00) being the most famous and the most prominent being the big ship along side the river. If you like museums you can easily spend a whole day going to museums in Melaka. Furthermore it's also possible to take a trip on the river with a tour boat for a reasonable price. For me, who doesn't like to go to jewellery or wood art museums Melaka was a bit 'meh', besides the food that is. I was loving the food, no doubt about it (YUM! ), but spending a whole day in museums and forts is a bit too much for me. 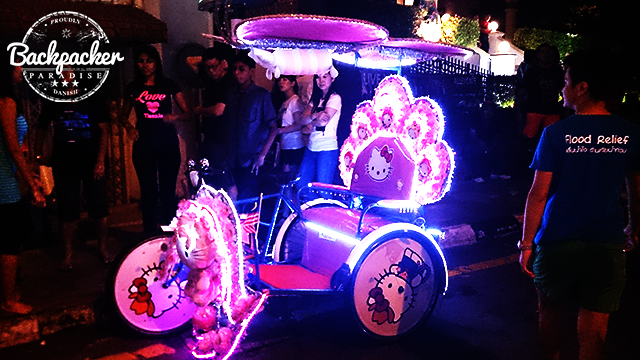 If you get bored here, simply take a ride in the bicycle taxis. Be sure to pick one with good (and loud) taste in music and flashing lights.